What Can I Expect at a Consultation with a Licensed Insolvency Trustee? 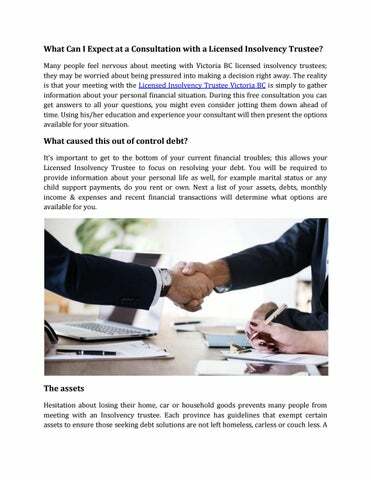 Many people feel nervous about meeting with Victoria BC licensed insolvency trustees; they may be worried about being pressured into making a decision right away. The reality is that your meeting with the Licensed Insolvency Trustee Victoria BC is simply to gather information about your personal financial situation. During this free consultation you can get answers to all your questions, you might even consider jotting them down ahead of time. Using his/her education and experience your consultant will then present the options available for your situation. What caused this out of control debt? Itâ&#x20AC;&#x2122;s important to get to the bottom of your current financial troubles; this allows your Licensed Insolvency Trustee to focus on resolving your debt. You will be required to provide information about your personal life as well, for example marital status or any child support payments, do you rent or own. Next a list of your assets, debts, monthly income & expenses and recent financial transactions will determine what options are available for you. complete picture of all assets including RRSP’S, TFSA’S, insurance policies, recreational vehicles, any potential windfall (eg inheritance or settlements) will determine their value and which are exempt from creditors. Your debts Disclosing the total amount of debt to your Licensed Insolvency Trustee helps them determine in you are insolvent and what solutions are available. 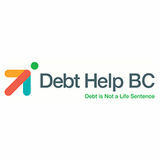 Any recent loan or credit card statements, collection notices along with a simple list of other debts to family or friends should be included. It’s important to provide all debts to agencies like Revenue Canada as well for a clear picture of your total debt to your Licensed Insolvency Trustee. What Can I Expect at a Consultation with a Licensed Insolvency Trustee?